Because we arrived late and rested for a while at the hotel, it was almost midnight when we went out for dinner. Of course, most restaurants are closed by then so we ended up eating noodles in one of the numerous "carinderia" on-wheels along the street near Pub Street and the Night Market area. 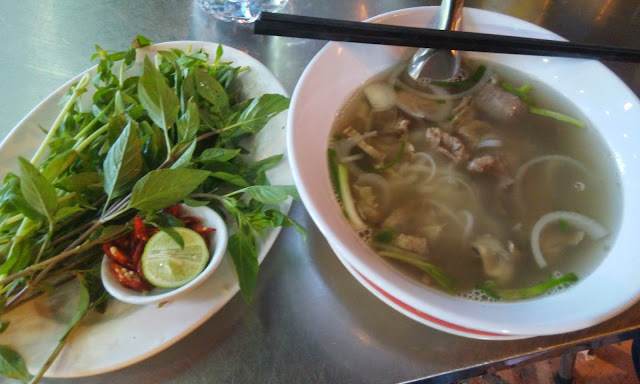 I ordered beef noodle soup which is similar to the Vietnamese pho. Broth was very flavorful and tastes refreshing because of the herbs. It also has tons of holy basil and tamyao which I really liked. This costs USD$2. I washed it down with bottled water bought from the convenience store nearby. A liter of bottled water is worth $2. My friend ,who is on a perennial diet ordered stir-fry noodle with vegetables. This costs $1.50. She was quite amused to received lots of riels as change when she paid for the food. This food is similar to our pancit except that the sauce has a subtle soy sauce flavor and is not salty. It has leeks, onions and water spinach (kangkong). We also made friends with a Canadian couple who also just arrived in Siem Reap and is in search for food. The husband espied my friend's stir-fry noodle and asked her about the taste. He also mentioned that they'll be in Siem Reap, Cambodia till Saturday before going to Thailand. The wife amusingly told us that they're staying at the Golden Banana Hotel which is near Pub Street. 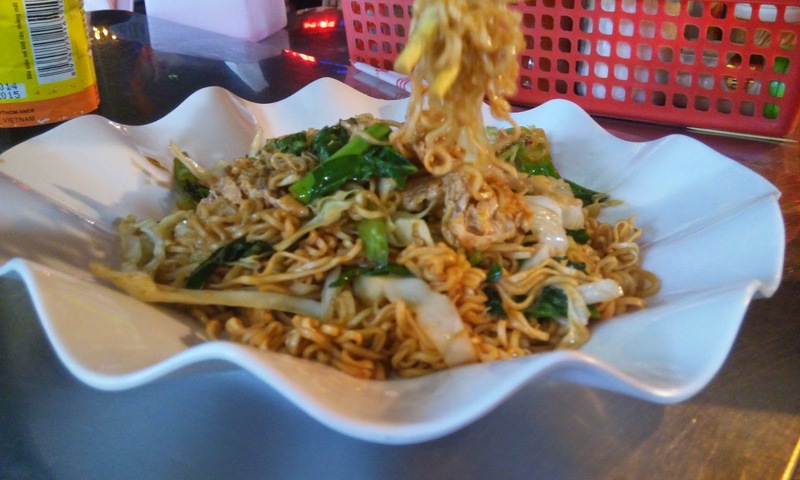 Read about Khmer food at the Golden Coconut Restaurant here. Eat at Rina Rino restaurant outside the Old Market :) We just had their pomelo salad, lime soup and stuffed cuttlefish. It was a different level of flavourful!